Amy Farrell started her career in 2006 at WPP working for Young and Rubicam Brands and Wunderman in San Francisco. Amy began working for Carat Fusion in 2007, which was later acquired by Aegis Media America. Spanning four years with Aegis Media America, she recruited for Carat (Media), Isobar (Digital Communications), iProspect (Search Marketing) and Posterscope (OOH). Amy joined WebMetro in October of 2012 after relocating from San Francisco to the Los Angeles area. Over the last six years, I’ve reviewed thousands of applications for some of the marketing industry’s top agencies. This includes positions ranging from entry-level media planners to executive leadership. In my current position at WebMetro, where the digital marketing agency continues to grow rapidly and has several openings, I am responsible for finding the best applicants. When I assess applicants and determine whether or not their information should be forwarded as a high potential candidate to the hiring manager, I specifically look for three things during this initial review process. We’re in a digital age, and marketers have to stay updated with technology. Applicants can (and should) expect recruiters to check their LinkedIn profile — especially if applying to an Internet marketing agency! Along with being a resume and interviewing tool, LinkedIn is a great way to get a foot in the door with excellent companies. On average, a LinkedIn member’s 2nd-degree network provides access to an additional 6,000 companies, 130 industries, and 9,000 people. Most resumes I see are very scattered, with no flow and little order. I don’t look for the fanciest resume, but I do look for concise, readable ones. If you’re inexperienced at resume writing, there are templates and resources available on sites such as resumetemplates.com. If you’re working on creating a strong resume, Monster.com also has good tips for resume presentation. At a marketing agency, there is a lot of internal collaboration, as well as with clients and various business partners. A resume that’s effectively and logically laid out reflects an individual with strong communication skills and an organized approach. When we’re looking for people that can present clearly; a solid resume provides that all-important first impression. Also, unless you’re applying for a creative or design position, I suggest holding back on the different-colored fonts and excessive usage of text enhancements. It can become a distraction, instead of a helpful attribute. Takeaway: If you’re not applying for a creative/design job, colorful fonts and enhancements can distract more than help. Recruiters are gatekeepers. The impression an applicant or candidate leaves on a recruiter plays a critical part in the review process — and first impressions are key. The in-person interview really isn’t the first one you have. The very first phone call, usually from the recruiter to a candidate (between an agency and the applicant) is interview #1. During that first conversation, I look to see how much homework the person I’m talking to has done on the agency, as well as whether or not this person has taken the steps to showcase his or her passion for becoming part of the WebMetro team. Type of Clients – Just about every marketing agency has a sample of its clients on the company website. Know what kind of brands or advertisers work with the agency. Some agencies specialize in specific industries or verticals. It’s good to know this information; you’ll show that you’re paying attention to your target audience. Key Differentiators – Find out what makes the agency different from its competitors. Does the agency specialize in a particular service? Does it employ a unique methodology or provide proprietary technology? Job Description – Make sure you review the posting, the job’s roles, and the responsibilities. Be ready to provide specific examples of how you demonstrated successful completion of the roles and responsibilities as outlined. Takeaway: The in-person interview really isn’t the first one. Your first phone call with the recruiter is. Competition for positions at a top agency is fierce. Be prepared, honest, and able to discuss what you can bring to a high-performance team. While the three areas covered in this article don’t cover every single thing an agency looks for, they can help you get ready for a successful initial interview — which is the first step in the path to an exciting career! Editor’s Note: What Makes Or Breaks You With Recruiters? According to BeHiring.com, when a job is posted, applications start rolling through in as little as 200 seconds, with about 250 resumes in total. Recruiters and hiring agents take minimal time on each resume — 5-7 seconds on average — with 17% reading your cover letter. In short, they’re going to make up their mind about you in the blink of an eye. Proofread Thoroughly — One spelling or grammar mistake, and your resume’s headed for the trash. Don’t Include A Photo — There’s an 88% job rejection rate for resumes with photos. Clean Up Your Act Online — One in three employers rejected candidates based on something they found about them online. Get A Professional E-mail — 76% of resumes are ignored if your e-mail address is unprofessional. 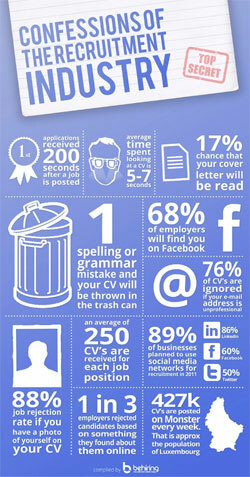 Takeaway: 76% of resumes are ignored if your e-mail address is unprofessional. Ready to dive into an interview? Our recruiters can connect you with the best job opportunities in digital, creative, and interactive anywhere in the USA. Check out a few of our featured jobs, or apply today to connect with us!